This month we conclude our series of articles on the future of memory. The final future memory technology we will cover is based on spintronics or spin transport electronics. Another common term for this technology is magnetoelectronics. These devices are also sometimes referred to as MRAM, or Magnetoresistive Random Access Memory. MRAM has been in development since the 1990s, and several companies have introduced production devices. The basic memory cell is a dual stripe of anisotropic magnetoresistive (AMR) layers separated by a nonmagnetic spacer. AMR materials were also used in the read head of magnetic recording hard disk drives. AMR is a change in the resistance of ferromagnetic conductors depending on the angle between the magnetization and the current. The magnitude of this effect is only about 2% for the most common magneto-striction-free NiFe or NiFeCo alloys suitable for device applications. The simplest form of GMR or Giant Magnetoresistive films consists of two magnetic layers separated by a Cu spacer, and had a magnetoresistance ratio of 6% initially and later more than 10% with improvements. The image below shows a drawing of a typical MRAM cell. Figure 1, Drawing depicting a Magnetoresistive RAM cell or MRAM cell. Higher tunnel magneto resistance improved the read speeds to on the order of 10 nsec. Unfortunately, the current needed for MRAM devices increases as the dimensions decrease, limiting the usefulness of this type of device. Researchers working to address problems with MRAM technology discovered that it is possible to use an alternate quantum mechanical property in the magnetic tunnel junction by changing the magnetic orientation of the thin magnetic layer. Basically, charge carriers such as electrons have a quantum unit of angular momentum or spin. An electrical current is generally unpolarized, consisting of 50% spin-up and 50% spin-down electrons whereas a spin-polarized current contains more electrons with a particular spin state. Researchers have demonstrated that it is possible to transfer spin angular momentum to a small magnetic element through a spin-polarized current. Spin-transfer torque RAM or STT-RAM has the advantages of lower power consumption and better scalability compared to conventional MRAM. In particular, the write current scales down with size, whereas MRAM write current scales up as the size of the cell decreases. Today, Sony and Hitachi are working as a team to develop this technology and introduce commercial parts in the near future. Figure 2, Cross-section of a Spin Transfer Torque (STT) RAM cell. The graph below shows the scaling of current for both MRAM and Spin Transfer Torque RAM. Notice that the current scales down as the feature sizes decrease for STT-RAM. The opposite is true with regular MRAM. 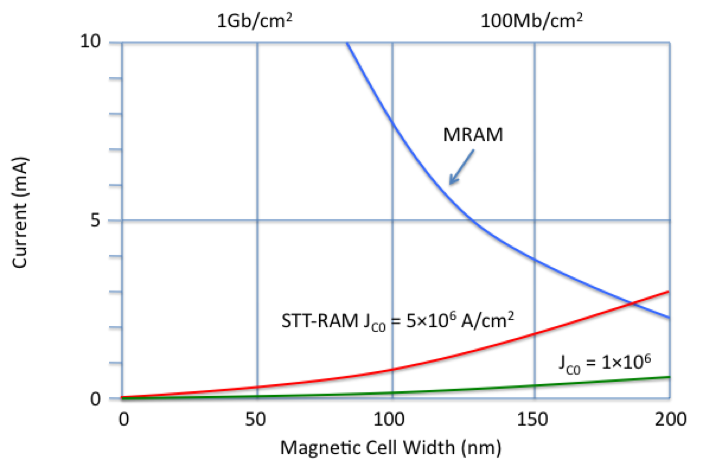 Figure 3, Current vs. cell width for MRAM and STT-RAM devices. 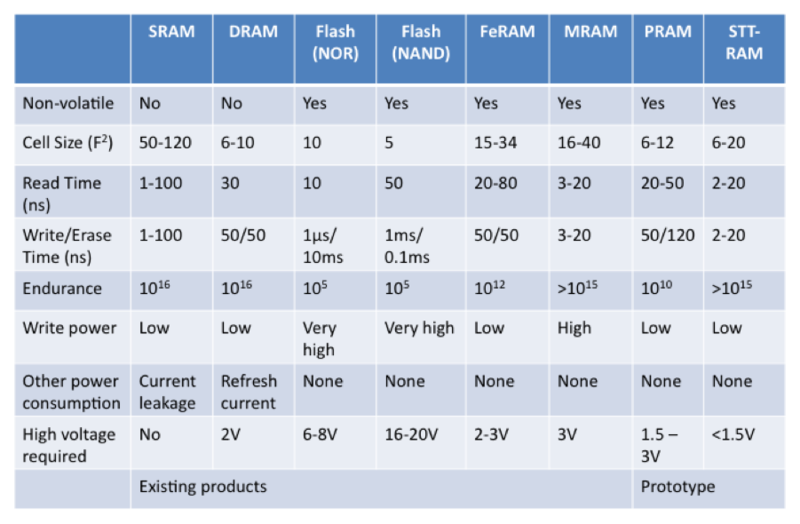 Table 1, Comparison of Memory Technologies. In conclusion, there are a number of potential memory technologies that may take the place of flash memory in the future. This table shows several of the leading candidates: ferroelectric memory, magnetoresistive RAM, phase-change RAM, and spin transfer torque RAM. Each device has its advantages and disadvantages. Current generation flash memory is increasingly limited by its cycle endurance. High voltage is required to write and erase flash memory, and the write power is very high. Ferroelectric memory solves the "high voltage" and "write power" issue, but falls short on endurance. 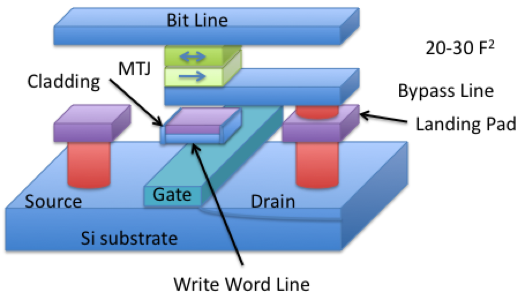 MRAM has a high endurance level, but the write power becomes worse as the devices scale down. Phase-change memory has low write power, but is somewhat limited in endurance. 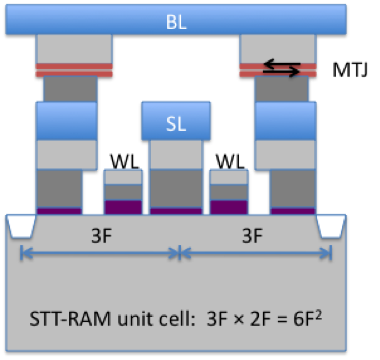 STT-RAM shows the most promise, but its development is still in its infancy, and the problems with write current have not been completely solved. Magnetic nanopillars is in its infancy, and is not shown on this table. Researchers and device manufacturers are likely to pursue these technologies for some time to determine which one will ultimately replace Flash as the reigning non-volatile memory. Q: What is the difference between MTBF (Mean Time Between Failures) and MTTF (Mean Time To Failure)? A: At first glance, the two terms seem to be the same, but there is a fundamental difference in how they are applied. MTTF assumes that the system is not repaired, so MTTF is basically the integral from 0 to infinity of the fraction of all failures for a given time with respect to time (add the equation). MTBF assumes the system can be repaired, and is repaired instantaneously. The equation for MTBF adds the time variable explicitly into the integral. Therefore, MTTF is a more appropriate variable for a system or component that cannot be repaired, like an IC, whereas MTBF is more appropriate or systems that can be repaired, like an automobile or PCB.